If we are Facebook friends, you might notice that I frequently celebrate when a big company like Google enters into another space. Competition a large company brings is great for consumers. We all know what the customer service is like when there is little competition. The prices creep up and the quality shrivels. Before you know it your resenting making that broadband or cable TV payment every month. A shout out is due to Hugh Briss of Social Identities, since our discussion on Facebook today inspired me to register a domain and be pleasantly surprised enough to share the results. 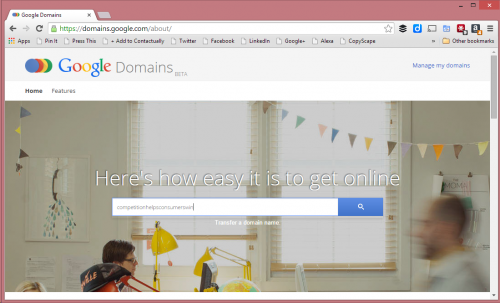 This week you might have heard that Google has started offering domain name registrations. The main feature they are touting is the dynamic DNS. Dynamic DNS allows you to have your domain name or part of it change whenever your public IP address does. This can be useful if you want to be able to access something on your home network but do not have a static IP address through your hosting provider. After doing my own registration of a new domain, I found the dynamic DNS to be just one of many great features they are offering. Let’s take a tour of the process and then we can evaluate some of the other advantageous features. The process is really simple, especially if you’re already logged in to a Google account and have a Google Wallet payment method setup. Step 1 – registering your domain name. By accessing domains.google.com you get a dialogue box to type in a new domain name. I chose “competitionhelpsconsumerswin” and clicked the search button. 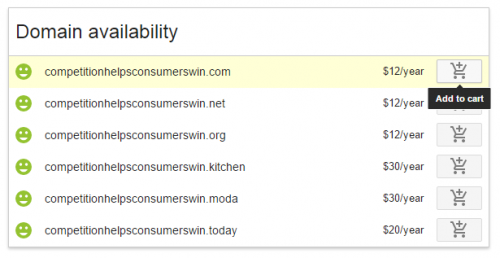 Step 2 – Managing and configuring your domain name. Once you’ve paid for your domain and provided your registration information. You now have the opportunity to add things like Email forwarders, custom DNS records and even website creation through some third party providers.